I hadn’t planned to sign up for this run, but my run buddy Farah who had signed up for this run with her gym buddies suddenly had to back out of this run because she had to attend a friend’s wedding. Not wanting to let her bib go to waste, she offered it to me so that I could “run on her behalf”. 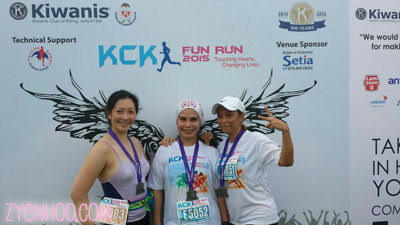 The KCK Fun Run was organised by the Kiwanis Club of Klang to raise funds for their organisation. The starting point was at The Oval Lawn in Setia Alam. Adiah had picked up the race packs on behalf of Zaliza and Farah, which meant that I just needed to take my race pack from Adiah. We met at the Oval Lawn early in the morning, where Adiah passed me the race bib. Well, actually I wasn’t that early; I arrived just before 6:30am (flag-off was at supposed to be at 7am). Because of my tardiness, I couldn’t park at a proper spot because they were all full. I had to park on the highway which was about 5 minutes’ walk from the lawn. I wasn’t the only one though; I made sure I parked where I saw many other cars were parked. We met at the Start Line; Adiah advised me not to go to the field because it was very muddy due to the heavy downpour the night before. Because it was a fun run (and probably due to lack of sponsors), this run was not timed, i.e. there was no timing chip on the bib. The 10km runners were flagged off first, a little after 7am. The route took us around the vicinity of the Setia City Mall, which was still fairly new. Although it wasn’t timed, I wanted to try to see if I could improve my own personal best. However, my plans were spoilt because of the way the Finish line was set up. In most races, the Start and Finish arches were the same, so runners knew when the run was at an end. So like most runners, I made the same assumption. The moment I ran past the red Start arch, I stopped my timer and slowed down, looking around for the medal distributors in vain. Many of the runners had even stopped to take a drink at the Tropicana Twister booth which was set up just beyond the arch. A lady came up to me jingling a collection box, asking me for donations – to which I had to explain that I didn’t bring any money with me (few runners carry cash with them in a run!). Approaching the Finish! … or so I thought. I was merely approaching the Start arch which had nothing to do with the Finish. Luckily Andrew who had completed the race much earlier was hanging around near the Start arch, waiting for us, just so that he could tell us that this was not the Finish line! If Andrew hadn’t told me, I would have wandered around foolishly wondering where the medals were. He told me that the Finish line was another 200m away; he pointed out the route I had to take towards the Finish arch. Thanking him, I restarted my timer and continued my way to the Finish line. The Finish line was still quite far! I don’t know why the organiser was so foolish as to put the Finish line beyond the Start line! If they wanted to place the Start and Finish lines at different locations, they shouldn’t have made the route to the Finish go through the original Start arch. So many people made the same mistake I did; there were even complaints on the Facebook Page after the event. Needless to say, my personal time was pretty poor this time. In fact I even slowed down at the end just to take photos of the Finish arch (I always do, for runs that are untimed). I finished the 10km in 1h24m. Finally approaching the REAL Finish line! Why is there a timer here?? Does the time matter?? Our bibs have no timing chips! The medals were distributed just beyond the Finish line, so I didn’t have to hunt for them! Andrew showed me where I could collect my free stuff which runners were entitled to. For the first time ever, I got free eggs and sausages at a run event! Although this was to my dismay… because I had just bought eggs (the exact same brand, no less!!!) the day before. Oh well, free food is not to be sneezed at. Adiah had called me to ask where I was, and I had to tell her to keep running!!! She made the same mistake as I did, too! And she had to tell Zaliza the same. I must admit, the photo board where we could take photos was pretty cool. All in all, not exactly a great event, especially with the confusing Start/Finish fiasco. The best things at this run were the photo board and the free eggs and sausages. Still, I must say that in spite of the setbacks, the organisers did their best. They did manage to get sponsors for other things, including the food and drinks (Tropicana Twister which I forgot to take my free drink from!! And of course 100 Plus, and the eggs and sausages). Still, thanks to the organisers for putting together this fun run! MK Land Colourful Fun Run – a very challenging route!